Sen. Bernie Sanders (I-VT) released 10 years of tax returns on Monday, putting to rest criticism that he'd refused to be transparent while showing his best-selling books have made him one of the "millionaires and billionaires" he loves to rail against. This is all just a distraction so we don't talk about Bernie's policy of removing the skin of every millionaire to fashion moccasins for the poor. Using Madbomber logic anyone who has a vehicle is part of the 1%. Capitalism and Socialism can work side by side. Capitalism works best where competition is in play. Socialism works best when monopoly is in play. I've been reading a lot of hostility towards Bernie. Apparently people seem to think he was against people being rich. Whoever the troll was that started this is doing his Russian masters proud. "Apparently people seem to think he was against people being rich." Has anyone on the riiight not made that claim? Having a million dollars is a far cry from being a "one percenter"
I don't begrudge Bernie's success nor the money he's made by writing a book. What I do begrudge him is his behavior on Facebook. I follow him and multiple times a day I get updates in my news feed that are very Trump-like in that they're a picture of Bernie with a quote from Bernie attached to a little screed by Bernie. The self adoration is very very evident and unnecessary. You aren't dense enough to actually think Bernie himself is running his facebook page are you? Bernie has a Socialism problem. He'd better be prepared to address it. He honeymooned in the USSR for --- sake. He is on record as saying, "I am a Socialist." Here is my personal take: He obviously admired Communism/Socialism earlier in his adulthood. His views have probably evolved over time and he's no longer an actual Socialist. Having said that, politics is a blood sport and while he probably won't get dinged in the primary for it, the GOP will absolutely hammer him for it in the General and he'd better be prepared for it. "Socialism" may have positive connotations among millenials and Gen Z....not so much for the older population which has the highest percentage of voters as a demographic. #11 I agree with everything you say, Jeff, except I think Bernie himself should bring up the subject during the primaries and begin to address it and not wait until Trump and the GOP go after him if he is the Dem nominee, which I still think he may very well be. Those things happened what...40 years ago? You've essentially watched him campaign for president for the last 4 years. If you can't understand what he's about and choose to focus on singular statements/events from half a generation ago, then you're a hack. But we knew that already. "things happened what...40 years ago? You've essentially watched him campaign for president for the last 4 years. If you can't understand what he's about and choose to focus on singular statements/events from half a generation ago, then you're a hack. But we knew that already." "Here is my personal take: He obviously admired Communism/Socialism earlier in his adulthood. His views have probably evolved over time and he's no longer an actual Socialist." That's the part Bernie has to make clear to those older voters Jeff mentions, who might not be as amenable to the idea of socialism as younger voters are. My point is, I think he should start sooner rather than later. No, but I would expect him to have some say in what is a very public medium. If he's not at least checking on how his people are doing now and then, that's not a very good sign, is it? And if one is trying to contrast themselves to Trump behaving in as narcissistic a fashion as Trump is probably not a great idea. #15, You calling it narcissistic and mentioning "his behavior on Facebook" implied you think he is posting this stuff. It's not a personal page, it's run by his campaign. They are paid to put up stuff about him. Facebook is an advertising platform where you tell them everything about your life so that they can better advertise to you. It's the same thing as Coca-Cola putting up stuff about Coke products. Do you think the CEO of Cocoa-Cola personally approves every thing that goes on their facebook page? I'd bet you $100 Bernie has no idea how to log in and post something to that page. Learn how to read, Li'l Joe. I was speaking to the reality of political campaigning. Mitt Romney got savaged for an alleged stunt he pulled in High School. He also got savaged for tying a dog crate to the roof of a station wagon. Was all of that stupid things to try and pillory him for? Absolutely. But, that is how negative campaigning works. Bernie probably won't get dinged in the primary where the word "Socialism" in in vogue these days. But he sure as heck will get hammered for it in the general, fair or not. That's exactly what I was trying to convey. #16 cool story bro. What part of my second post addressing your first post indicated I still thought Bernie runs his own page? #19, The part where you continued to call political campaign posts narcissistic (as if a political campaign can be anything other than that). Really it was the ridiculousness of your first post that made me think you probably needed facebook explained too you a little better. If everything known about him is true, he never had a job before his elected position. He lived off of the government as much as possible. So, what he did was get elected and thus rode that train to being a millionaire eventually, off of taxpayer money. The part where you continued to call political campaign posts narcissistic (as if a political campaign can be anything other than that). It isn't like that for other politicians. And his feed has been like this for as long as I can remember. In any case, trotting out the "they're all the same" line is intellectually lazy. Really it was the ridiculousness of your first post that made me think you probably needed facebook explained too you a little better. Let me guess, you work in IT/tech and just couldn't pass up an opportunity to share your knowledge with the underlings? Even though it was clearly a canned speech that wasn't necessary to begin with. t I do begrudge him is his behavior on Facebook. I follow him and multiple times a day I get updates in my news feed that are very Trump-like in that they're a picture of Bernie with a quote from Bernie attached to a little screed by Bernie. The self adoration is very very evident and unnecessary. I realize you're in a --- for tat about this with QCP. But to reemphasize a few points. Bernie is running for president. He's campaigning. His public Facebook account is run by his campaign and they're attempting to spread his message, keep his base excited about him, and push his ideas. As well as comment on current events. Your gripe seems a bit trivial and personal. I don't really understand the objection to a candidate posting a photo of themselves with some words that they said. Every candidate's page is covered in photos of the candidate. Putting words on it makes it problematic? 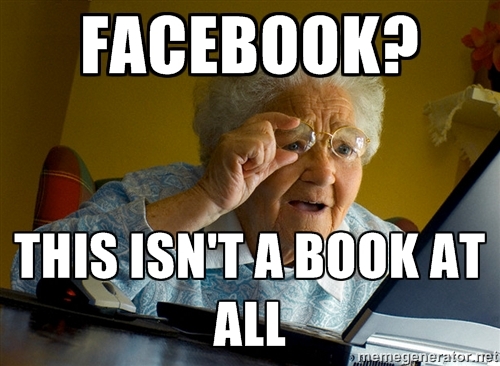 It was more that you came across a naïve old fart who mainly uses facebook to look at pictures of your grandchildren but also believes and/or takes at face value everything they see on there. What can I say, I took pity on you. You seemed deserving of it. Hopefully you'll take what you learned today and apply it to other things you see online. Ahhh the corky "I look like a pretentious tool so I'm going to respond with unnecessary condescension" shtick. Unnecessary? I beg to differ. Of course you do. Without smug assumptions of your own intelligence what else do you have? The entire reason this exchange is hilariously stupid in your account is you blew right by my admission that Sanders doesn't run it. And in doing so ignored my point that I would expect them to at least be aware of their social media presence enough to realize they're behaving like Trump. To which the obvious response would be "maybe they do and they don't care because they're more interested in the recognition and associations they're trying to build than appearing to be like Trump". Or "they all do that to some degree and have in the past, it just wasn't as apparent because social media wasn't a thing". I'll direct your attention to posts 25, 26 and 27, all made after your "admission." I didn't comment further on your Trump point because it wasn't a good one. Anything else? Admission doesn't belong in quotes. Other people's posts don't change your launching an unnecessary diatribe about "how Facebook works". Just seems a little too God complex to me, as if they're somebody of great meaning saying something profound or original. Yeah Bernie, we know you're shaking your fist at insurance companies and are really really angry at them. Ok. But at least you know he's not the only Dem candidate doing that. #37 correct. But this is a thread about Bernie and it's my understanding that neither Harris nor Booker have nearly the groomed image of an every man politician like Bernie does. Correct? When you quote someone you use quotes, no? #38 You're te one who claimed other candidates don't do it. That was wrong. No need to manufacture nuance to get out of it. We've all been there. "periods go inside quotation marks when they're at the end of a sentence"
Not true. AP Style allows for both. If the entire quote is a sentence, I'll put the quote outside the period. If it's a fragment, inside. Periods and commas always go within quotation marks. Dashes, semicolons, question marks and exclamation points go within quotation marks when they apply to the quoted matter only. They go outside quotation marks when they apply to the whole sentence. You're te one who claimed other candidates don't do it. My comments were limited to Sanders until you posted the Harris and Booker links. I acknowledged as much when I stated that that was an appropriate response. I mentioned it only because it's another way in which the supposed outsider Sanders is the same as everybody else. The first line of your #24? Didn't notice it until I started following him. For me Facebook is sort of like the kitchen junk drawer-it's full of things you think might be useful someday but don't want to get rid of after you've yet to find that thing. So basically, periods go within commas...except when they don't. Indeed. Missed that when I reread my comments. Thank you, #43 - I was actually writing a draft of a cover letter, and realized I boo boo-ed. Good show! #42 seems to be unsure of his grammar skills. #47, No. Periods and commas always go within quotation marks. The rest is about other punctuation. At least that's how I'm reading it. Am I missing something? Dude. You made that claim 1000x. "No. Periods and commas always go within quotation marks. " That's silly: if a phrase ends with a comma, that's in??? As in "if a phrase ends with a comma,"
The bride was a newspaper editor. Maybe the rules have changed since then, but she explained it in no uncertain terms: inside or outside, both acceptable. I was not at all surprised to see fox news saying "Bernie is a socialist but he made a lot of money! What a hypocrite!" headline. Selling the LIE that socialists are opposed to people making money. What DID surprise me is to see other news sources pushing that same fallacy. Just goes to show how there really is no leftist mainstream media. There's fox news insanity, then there's CORPORATE news, and corporations are terrified of bernie and warren and will do everything they can to prevent them from being the nominee. "Periods and commas always go within quotation marks". Really? Seems, "odd." to always do so. What DID surprise me is to see other news sources pushing that same fallacy. The DNC is in full attack mode on Bernie. The Daily Show was ripping into him for supposedly being against the rich. Even though he never once said he was. He always said the rich are taking advantage of their workers. They need to be taxed and regulated. He still says that today. This is all an attempt to stop his incredible popularity across all parties. The DNC and the GOP can't have Bernie be our President. He's actually competent and has a plan to fix our federal government and restrain the control the rich currently have over it. #'s 53 and 55, I didn't make the rules, just pointing them out. Inquiring minds and all that. #52 | POSTED BY BRUCEBANNER"
I voted for Sanders in the primary, even after it was clear the superdelegates had the nomination locked up for Clinton. You sure you don't have me confused with Corky?? It's actually interesting about the rule. I did not know about it. But. This is a political blog and most of us are hurriedly typing on our smart phones while doing other things simultaneously. So. Generally we cut each other slack. If posters figure out they messed up badly, they will correct their mistakes. On rare occasion, we ask for clarification. But I warn you. I am a poster who regularly disregards the rules of punctuation. I get it and I'm not usually a grammar nazi, I was pushed in to it. See posts 35, 39 and 42. Hello. I'm Carajo and I'm an alcoholic. I know you're talking about Bernie. But I'm an American and I don't give a fluck. Georgia Bright Engel died at 70 yesterday and that crushed my heart a bit. Why? I had a huge crush on her when I was a child. In fact, the first time I blew a fuse, I was stroking my salami with her on my mind. I yammed myself with such ferocity that I fainted and fell out of my twin sized bed. My parentswww.drudge.com knew nothing of my fantasies about Georgia. They couldn't understand why I liked to watch "The Mary Tyler Moore Show?" Georgia did have some heavy hooters and she was smoking hot. She knew it too, that dirty birdie, and she hid it well behind her innocent mask. I wanted to be her husband. On our honeymoon, she whispered, Not so hard, Carajo. Let my sphincter open on its own. It was like stroking a bass cello. Now you know just a little more of me and you know nothing of me at all. Thanks your for allowing me to share. Both seem quite acceptable to me. Depending on the condition of Grandma. "Yes and he wants his own taxes to go up to." He could have sold $1 ebooks. Maybe he needs a calculator to figure out how not to be so darn rich. "He could have sold $1 ebooks." Anyone who wants to read his book for free can visit the library. I don't see the value in criticizing Bernie's success. "George Orwell was a committed leftist...and he wrote a whole book about socialists exploiting everyone around them for their own benefit." #66 you a jerky fan? So which is the party of the poor, in your mind? It's never a bad time to grab some more popcorn and cheer on leftist circular firing squads. Clintonistas accusing crazy uncle Bernie of being a grifter - my sides are in orbit! How many more threads on this particular topic are enough, by the way? This is at least the second if not third within the past week. Is someone busy constructing a narrative? coordinated establishment media assault notwithstanding. "coordinated establishment media assault notwithstanding." Yeah, it looks like the media assault against Biden as "creepy Uncle Joe" had the desired effect. He seems to have survived it. I recently saw a poll where 64% thought his hair-sniffing wasn't a big deal. #85 He survived it, yes, but he is no longer ahead of Bernie in the polls, so it did hurt him somewhat. Still, better to have the issue come up now rather than later. If it knocks Biden down, better that it does so now. As we engage with our opponents in the Democratic primary, we will forcefully present our views and defend ourselves against misrepresentations. But, let us do our very best to engage respectfully with our Democratic opponents - talking about the issues we are fighting for, not about personalities or past grievances. I want to be clear that I condemn bullying and harassment of any kind and in any space. Remember that our struggle is bigger than a Tweet or a Facebook comment. And remember that our primary opponents are decent people  many have been friends and allies of mine in the Senate. "Our number one priority is defeating Donald Trump. To do so, we will ultimately have to unite with those who today are our opponents for the Democratic nomination. We won't always agree with them, but I expect those who speak on behalf of my campaign to always engage respectfully." This tells me Bernie has got himself a pit bull and is probably playing hardball, behind the scenes at least, with his Democratic challengers. It tells me Bernie is in it to win it. David Sirota is an ultra-leftist attack dog and fanboy of Hugo Chavez. Sounds like a winner when you have to scrub your history. #90 he got a taste of power in 2015 and has been doing anything and everything since to get richer and more powerful. How supporters know he writes these things with a wink and a nod. That's why they go out with razor blades to cut down the left. FYI: It is a well known fact that Just Say Yes Nancy Ray-Gun sucked hard donor salami when Ronnie Ray-Gun was running for governor and then POTUS. I wonder how Bernie's puta puts out for the 1%? "Comprehensive immigration reform" aka, turn the Mexicans away at the border. I didn't dig up old articles about Bernie and socialism or his honeymoon in Russia. I pointed out that Bernie needs to address those issues, sooner rather than later IMO, because Trump and the GOP will try to make them issues if/when he is the nominee, which is also true. By addressing them now, Bernie can begin to take away their effectiveness as Trump/GOP talking points later. Yes, I pointed this out to nulli several times in recent weeks as you know. By addressing them now, Bernie can begin to take away their effectiveness as Trump/GOP talking points later. I thought so to.. then Liawatha actually did the test. It doesn't seem to have worked out that great. "If you want to oppose Joe Biden because he's too centrist, or too socialist, or too old school for your taste -- that's fine." I only objected to folks trying to turn Biden into a #metoo story, because based on what has come it, it isn't (but that could change). Also, I'm not sure we want to focus on what someone said 40 years ago if they have changed in the meantime, and that goes for Bernie as well as Biden, but the rest is fair game. "I thought so to.. then Liawatha actually did the test. It doesn't seem to have worked out that great." That's because Warren's test results and some Native American elders reaction to them didn't turn out as she expected. Bernie's situation is different. He has a better chance of controlling the narrative by addressing it head on. My 2 cents. YMMV. Ok. Now think of grandma as a "cougar". Cougar hunting is pretty fun. There can be gross moments in any Hunt. Like when you eat the heart of your catch. I catch so many cougars on a cougar hunt it's like when a dog catches a car. Don't know what to do with many of them when I catch them. So I release them back into the Wild. Still gross?? You want real gross?? Life consumes life. That is the Meaning of Life. To consume more life. That is what we do. Then we crap it out our butts. Then we think how special we are!! "That's because Warren's test results and some Native American elders reaction to them didn't turn out as she expected." The test results showed she had Native American ancestors and Native American leaders felt honored that she was proud of that. The media though has not been kind to her because she is not a corporate stooge as is Joe Biden. The corporations don't want Elizabeth Warren because they know she represents actual regulation and reform and she is smart enough to get it accomplished. Of all the dream candidates I think I would choose her. No, it's everyone that has a microwave oven. "The corporations don't want Elizabeth Warren because they know she represents actual regulation and reform and she is smart enough to get it accomplished." Which brings us to the Consumer Finance Protection Bureau, the brainchild of Senator Professor Warren, an agency that has returned billions of dollars to citizens swindled, burgled, or double-talked out of their money by large financial institutions. The Republicans -- and, especially, their donor class -- hated the CFPB and vowed to bring it down at the first opportunity. They got one with the election of the current president*, who quickly put Mick Mulvaney in charge of it. And it was Mulvaney's primary task to hollow out the CFPB's essential functions. "Mulvaney's careful campaign of deconstruction offers a case study in the Trump administration's approach to transforming Washington, one in which strategic neglect and bureaucratic self-sabotage create versions of agencies that seem to run contrary to their basic premises. According to one person who speaks with Mulvaney often, his smooth subdual of the C.F.P.B. was part of his pitch to Trump for his promotion to White House chief of staff -- long one of the most powerful jobs in Washington. Mulvaney's slow-rolling attack on the bureau's enforcement and regulatory powers wasn't just one of the Trump era's most emblematic assaults on the so-called administrative state. It was also, in part, an audition." The C.F.P.B. was created to protect Americans from predatory lenders after the financial crisis. President Trump's new chief of staff took it apart on his way to White House. "The test results showed she had Native American ancestors and Native American leaders felt honored that she was proud of that. The media though has not been kind to her because she is not a corporate stooge as is Joe Biden." To me, the media's handling of "But Pocahontas" is the new "But her emails." FWIW, I don't think the media has been particularly kind to Biden either. Creepy Unlce Joe is only a problem in the primary and he already seems to be weathering that storm. Creepy Uncle Joe is nothing compared with ------------- Trump.